Prep ahead- write letter h outline on cardstock and draw and cut out houses from cardstock. We also cut out little pieces to use as windows and doors. If my son liked drawing and was a little older I would've had him draw his own houses on the cardstock. 1. We learned the letter name and talked about how to write the letter h. My son liked tracing the letter again and again. We talked through how to write the letter h- "tall stem down and make a hump." 2. Next we wrote a letter h using Elmers glue and then my son stuck the houses on the letter h.
3. Next my son put glue dots on each house for the doors. 4. Then he stuck little rectangles on each house so that they each had a door. We were going to try putting windows on, but there wasn't much room. 5. Once everything was dry I cut out his h and mounted it on purple paper so that the letter was more visible. We continued to practice writing the letter h in the air while we practiced the letter name, key word, and sound. Eek! 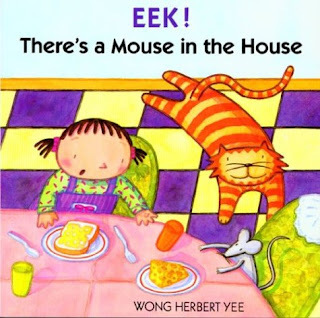 There's a Mouse in the House by Wong Herbert Lee would be a fun book to read along with this h project! Do you have an art activity for each letter? Such as "D is for dog" and "H" is for house? I want to do one where I spell each letter in Kailee's name.... love these! Keep them coming!